I generally find that most archers do well with the brass point (or tied-on, where preferred) is best set so that when the arrow is loaded on the string under the point, the under side of the nock is about 5/16" above square. 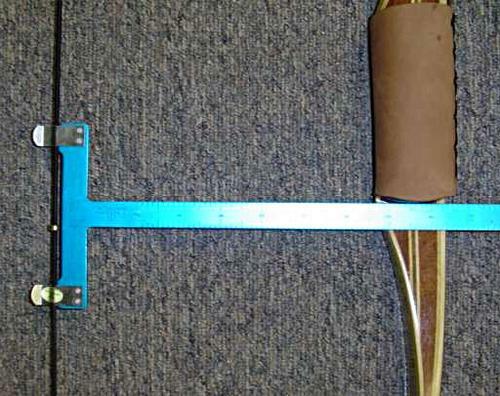 This will vary from bow-to-bow as well as with archer to archer and the quality of your individual release. The more rock-steady and quick your release, the lower it may be. The rule of thumb is to start with the nock point set high (5/8" above square) and go down 1/16th at a time until problems in arrow flight are apparent, and then back it up to where flight is good and consistent. A proper nock REMOVAL tool is best for doing this. Otherwise, if the serving is solid, it's possible to set it for a snug, but moveable fit and adjust it as you test arrow flight. It can also be done with a piece of masking tape on the string covering the inch up from square to the shelf, and simply mark it when you have it figured out. Then, put the arrow on the mark on the tape and remove excess tape above the nock. Install the nock point and then remove the rest of the tape.